Does Chelsea Clinton have a future in elected office? 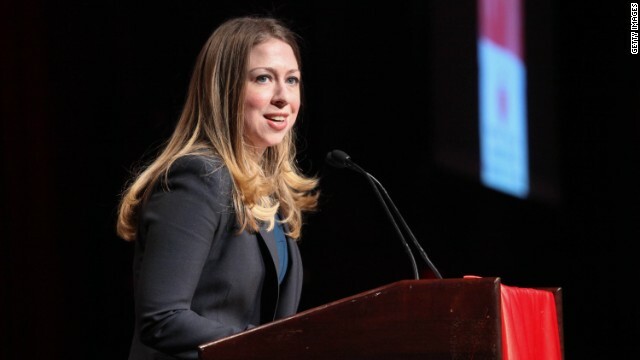 (CNN) – Chelsea Clinton is once again keeping the door open to a possible run for office in the future. "I live in a city and a state and a country where I support my elected representatives. If at some point that weren't the case, and I didn't support my mayor or my city councilwoman or my congresswoman or either of my senators – and I'm lucky to live in a state where I have lots of women representing me, you know – maybe then I'd have to ask and answer the question for myself, and come to a different answer," Clinton said in an interview with Fast Company magazine. We want you to weigh in: Do you think Chelsea Clinton has a future in elected office? Was she ever elected homeroom monitor or class president? Has she ever held a job with profit and loss responsibility? Is there anything to commend her for office other than name recognition? She's not even as qualified for public office as her mother – which is to say not at all. Reeally sick of the elitist politico-social Dynasties quite frankly. To mmany political Dynasties and Dinosaurs in our elite power structure I feel. American system needs some new blood and new minds to keep this country vibrant in the 21st Century. Now Chelsea isn't so totally bad, but I'm sick of Dinosaur Families in the upper echelon's in power. Chelsea has a bit of a reputation though that could be useful. Maybe not Presidential or Senate material. I am thinking her rep and demeanor be most useful somewhere from the House of Representatives to maybe Ambassadorship. Really for all her contacts and knowledge though, I always mused that maybe Chelsea do best as a Media personality too. If a drunk moron like George Dubya Bush can have a career in politics, then anyone from a famous political family can. Chelsea Clinton grew up in the White House and will become a very successful politician like her parents. Bush 43 was a reformed tee-totaler with advanced Ivy League degrees. And you? No! She is one of the least impressive people I have ever seen. Just say no! There has to be a law that stops this monarchy of the politically powerful to be able to inject their heirs into our nations political seats. If its not bad enough to listen to all of these old rich cats argue like children then rather talking about history over the diplomacy over real matters. Its listening to their spoiled rotten siblings explain how they worked so hard and understand the groundswell peoples opinions and struggles. They will never know what its like to live paycheck to paycheck. Apparently there is some sort of dynasty or magical omen that the wealthy and powerful offspring are the chosen race of leaders meant to live a life tax free and literally smile with the stroke of a pen as we the people(peasants) get are backs broke in to two by corporate multi-millionaire lobbying in the office meant to defend us against. The truth of why people won't cast a vote is the simple fact that who they are voting for is chosen by all of the people who have designed the taxes and laws that defend the rich and enslave the poor. As for our country which I will freely call my house there is an old saying that I love to announce in times of trouble," How can we help anybody if we cannot help ourselves?" To the kings and queens of the United States of America, All Hail your glorious pampered tooshes and may your next meal be filled with the finest of all spices and the sweat of your american family members in the next room!" I love how all she has to do is say that she may run for office in the future and that is enough to be attacked by people on the internet. My 8 year old brother may run for office someday, does anyone want to try to tear him down? I don't think she has the drive for it. Could she be elected? Of course. But it takes a certain personality to desire to get into politics and thrive there... and it feels like she lacks it. I kind of think of her as a Maria Shriver type. Has the family background for politcs and would have had the ability to be elected, but lacked the interest. you've got to be kidding – she couldn't even keep her TV show for a month! she's boring, as narcissistic as both parents, and for all her education, appears rather stupid!!!! oh wait – she has ALL the requirements for elected office!!!! What a mess this Country is in ! Can a child fix it ? NO! Not if she's going to do things anything like her parents. We've already got way too many Free-Traitors as it is and her parents Bill and Hillary Clinton are two of the biggest FREE-TRAITORS around. She already knows how to lie and obstruct justice, having been around the 2 biggest. I'll care about this when/if she files as a candidate for something. Wow, almost word for word what was going to post when I read the article. Thank you. People are so tired of TEA/GOP Clinton bashing. Unfortunately it seems that both sides are still able to get most people to buy and drink their flavor of Kool-Aid, only thing is, it's just different flavors of the same brand and both flavors are making the American People and the Real American Economy sick. Both parties have sold out the bulk of the American citizens, who they're supposed to represent, by allowing the incursion of illegal aliens and the "out-sourcing" floodgates to open wider and wider without taking any sensible measures to stem the tide. Over the last 25-years our government has allowed our country's industries to get sucked out to China, India, Mexico, etc and allowed illegal aliens and H-1B foreigners to come into our country and take away tax-paying Americans jobs and drive down prices and wages. Of course she has a future in politics! She's already in politics. She's known politics since she was able to speak, read, and write. What else has she been exposed to? Definitely not hard times, broken home, living pay check to pay check, paying back a college loan, homelessness, hunger, lack of health care, fear, insecurity, etc.